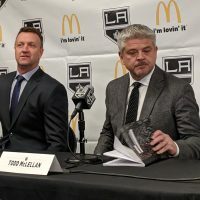 It’s understandable why much of the chatter following the Kings losing two players on waivers a few weeks ago centered around defenseman Thomas Hickey – after all, he was a former number one draft pick. However, they also lost forward Rich Clune that day. And tonight, he returns to LA with the Nashville Predators. 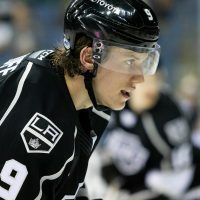 Originally taken by the Dallas Stars in the third round of the 2005 NHL Draft, Clune made his way to the Kings organization via a trade in the summer of 2008. At 5-foot-10 and a three-time 20-goal scorer in the OHL, he was a typical Dean Lombardi acquisition – a guy who was loved by his teammates and would run through a brick wall for you. 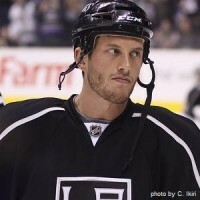 Clune made his NHL debut with the Kings at Staples Center on February 11, 2010 vs Edmonton. 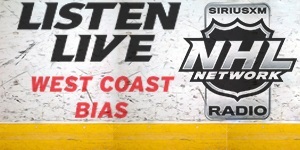 The following night he recorded two points, both assists, against the Colorado Avalanche. He went on to play 12 more regular season games with the Kings that season and then saw action in four playoff games vs. Vancouver. 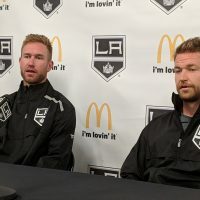 He’s spent the last two years with the Manchester Monarchs of the AHL, where he never found an opponent he wasn’t willing to drop the gloves with. His appreciation extends beyond just a general thank you though, there were two individuals he wanted to specifically mention by name. Since being acquired by Nashville, Clune has played five games for the Predators this season and in typical fashion, he’s already had three fights. On a personal note, he was always a pleasure to deal with, even though some of his best answers were things we wouldn’t print here on MayorsManor. 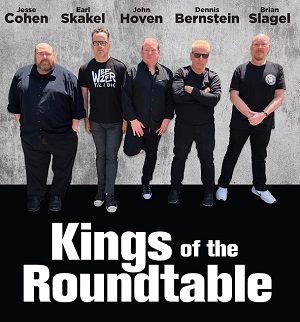 He never ducked a question and wasn’t afraid to put his comments out there – including the time he said there weren’t a lot of guys in the Kings locker room who would ever win a scoring title (link). Best of luck to Rich Clune. A one-in-a-million character. 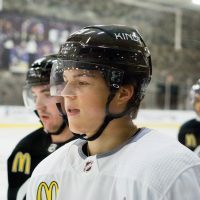 “Cluner” was one of the most popular players to wear a Monarchs jersey. While just an animal on the ice he is quite the gentleman and those fans lucky enough to meet his mother knew where he got his manners and fighting spirt. A testament to popularity on and off the ice is reflected with the amount special game-worn jerseys sell at auction. Rich’s “Pink in the Rink” jerseys sold for a low $3,000 to more than &4,500. I’m sure it’s no exaggeration to say Rich raised the Monarchs Care Foundation nearly $20K during his time in Manchester. He will be missed by all, good luck Cluner.